In The Commodore, Dr. Maturin obtained an awantibo (Angwantibo arctocebus, aver. wgt. 2.2 lbs, aver length 10 in.). We don't have one here at the American Museum of Natural History, but we do have pottos. The awantibo is similar, slightly smaller (aver. length 14 in. 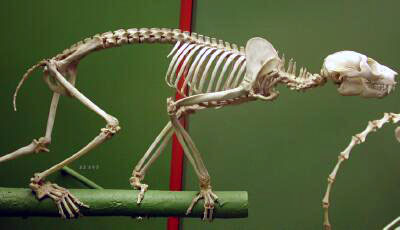 ), like this specimen, and of a more golden color and tailless. Awantibos and pottos share the same environment, but divide the territory. 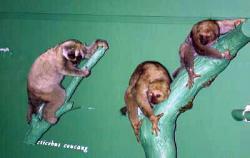 They both live in the rain forest of Africa and Southeast Asia, and in the trees. Pottos live in the treetops, eating mostly fruit and some insects. Awantibos live in the understory, eating mostly insects and some fruit. From this mounted skeleton of a potto, (perhaps looking like Mrs. Wood's specimen), you can see the "curious anterior dorsal vertebrae" that caught the Doctor's attention. These are for protection. In the forest canopy, the most dangerous predators are snakes and predatory birds. In case of a bird, the potto rolls into a ball with his neck outwards facing the attack. These spines like projections on his back provide no place for a bird to grab hold; if the birds try to unroll him, the potto bites. If a snake approaches, the potto simply lets go of the branch and fall to the forest floor. Even a fall of 30 to 40 feet would not injure such a small animal. In all his travels, the Doctor did get to see many interesting mammals that weren't primates. Let's head for the Hall of Fossil Mammals.